A mobile cloud is a cooperative arrangement of dynamically connected communication nodes sharing opportunistic resources. In this book, authors provide a comprehensive and motivating overview of this rapidly emerging technology. 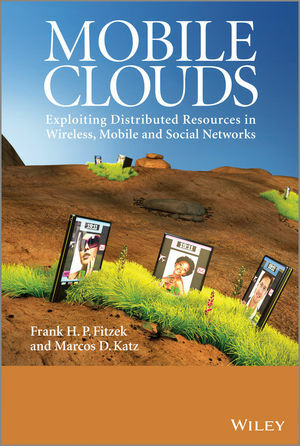 The book explores how distributed resources can be shared by mobile users in very different ways and for various purposes. The book provides many stimulating examples of resource-sharing applications. Enabling technologies for mobile clouds are also discussed, highlighting the key role of network coding. Mobile clouds have the potential to enhance communications performance, improve utilization of resources and create flexible platforms to share resources in very novel ways. Energy efficient aspects of mobile clouds are discussed in detail, showing how being cooperative can bring mobile users significant energy saving. The book presents and discusses multiple examples of mobile clouds applications, based on both existing commercial initiatives as well as proof-of-concept test-beds. Visions and prospects are also discussed, paving the way for further development. As mobile networks and social networks become more and more reliant on each other, the concept of resource sharing takes a wider and deeper meaning, creating the foundations for a global real-time multidimensional resource pool, the underlying infrastructure for shareconomy. Above all, this is an inspiring book for anyone who is concerned about the future of wireless and mobile communications networks and their relationship with Social networks. This book is an excellent resource for wireless/networking researchers in industry and academia, students and mobile phone programmers. Managers interested in new technology developments, service providers, network operators, and those working in the gaming industry will also find the book insightful. Frank H. P. Fitzek is a Professor in the department of Electronic Systems, Aalborg University, Denmark. He received his diploma (Dipl.-Ing.) degree in electrical engineering from the University of Technology - Rheinisch-Westfälische Technische Hochschule (RWTH) - Aachen, Germany, in 1997 and his Ph.D. (Dr.-Ing.) in Electrical Engineering from the Technical University Berlin, Germany in 2002 and became Adjunct Professor at the University of Ferrara, Italy in the same year. He co-founded the start-up company acticom GmbH in Berlin in 1999. He has visited various research institutes including Massachusetts Institute of Technology (MIT), VTT, and Arizona State University. In 2005 he won the YRP award for the work on MIMO MDC and received the Young Elite Researcher Award of Denmark. He was selected to receive the NOKIA Champion Award several times in a row from 2007 to 2011. In 2008 he was awarded the Nokia Achievement Award for his work on cooperative networks. In 2011 he received the SAPERE AUDE research grant from the Danish government and in 2012 he received the Vodafone Innovation price. His current research interests are in the areas of wireless and mobile communication networks, mobile phone programming, network coding, cross layer as well as energy efficient protocol design and cooperative networking. Marcos D. Katz works as a professor at Centre for Wireless Communications, University of Oulu, Finland. He received the B.S. degree in Electrical Engineering from Universidad Nacional de Tucumán, Argentina in 1987, and the M.S. and Ph.D. degrees in Electrical Engineering from University of Oulu, Finland, in 1995 and 2002, respectively. He worked as a Research Engineer at Nokia Telecommunications from 1987 to 1995. From 1995 to 2001 he was a Senior Research Engineer at Nokia Networks, Finland. In 2001–2002 he was a Research Scientist at the Centre for Wireless Communications, University of Oulu, Finland. In years 2003–2005 Dr Katz was the Principal Engineer at Samsung Electronics, Advanced Research Lab., Telecommunications R&D Center, Suwon, Korea. From 2006 to 2009 he worked as a Chief Research Scientist at VTT, the Technical Research Centre of Finland. His current research interests include cooperative and cognitive networking as well as optical communications, particularly visible light communications.